If you think there’s something wrong with your sewer drain, but you aren’t quite sure, please don’t DIY the solution. The best thing you can do is call Dr. Pipe Drain and Plumbing Services . We will perform a free, no-obligation drain inspection and come up with solution for your drain repair. Old pipes deteriorating and becoming a serious problem. If any of these problems apply to you, we can assess the problem and offer the best solutions to repair your drains. Traditional repair: A trench is dug to gain access to the underground pipes. We may use heavy construction equipment to excavate your lawn, and refill the area to complete the repair. The traditional repair has the advantage of exposing the problem to our experts (and everyone else) to see. Trenchless repair: A method of pipe repair that leaves your lawn relatively undisturbed. A video inspection is performed, and holes are dug at the beginning and end of the damaged section of pipe. No trench is required. Pipe bursting: New pipe is passed through old, damaged pipe. The old pipe bursts as the new drainage system is set. This is best for PVC, clay, concrete, iron, terracotta and other pipe systems. Pipe relining: While this method involves some digging, it is less than the traditional method. It creates a “pipe within a pipe”. Pipe relining is best used to seal cracks, and repair holes, and damage caused by roots and rust. Trenchless drain repair can be completed in one day. The most time consuming parts are the video inspections at the beginning and the end, and drilling the repair holes. A traditional method can cause so much disruption to your household for days. During that time, you can’t use the bathroom, shower, do laundry, or any activity where water goes down the drain. 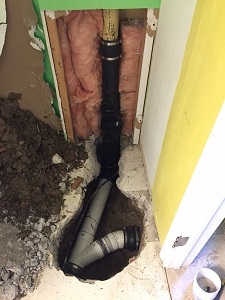 A trenchless repair is performed using seamless pipes, which don’t have joints like traditional pipes. Seamless pipes are made from HDPE, which is an extremely robust material that will last for decades. Since seamless pipes use HDPE, they are less likely to need repairs than traditional pipes. Recall that trenchless repairs don’t have joints. This may result in better flow than you initially had from traditional sewer pipes. Our best estimate of sewer replacement costs come from our no-obligation inspection. Call us today to schedule one. Every case is different, but the sooner you call, the faster we can address the situation. Implementing a trenchless drain repair is less expensive than a traditional repair. Through its robust material HDPE, a trenchless repair will normally have lower maintenance costs throughout its life. Our customers love us, and our work is the best quality. Stop by our testimonials page, then give us a call for a free, no-obligation quote for drain repair in Ottawa.